What’s growing in the hoophouse; reading; planning for winter. Tokyo Bekana in the hoophouse. In the hoophouse we are perhaps half way through our bed preparations. The Tokyo Bekana was the first crop we transplanted from our outdoor nursery bed, and it’s looking very sturdy now. We’ve also transplanted some Yukina Savoy and the first of the lettuces. Cherry Belle radishes in the hoophouse, early October. 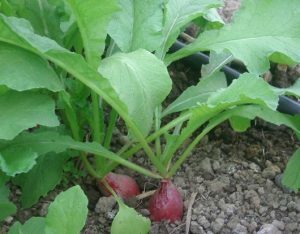 The crops we direct sowed in early September are growing well, and we are harvesting the radishes and some of the tatsoi and Bulls Blood beet greens (thinning to 6″ apart). The spinach is big enough to start harvesting but we haven’t needed to yet. Hoophouse tatsoi in early October. The newer sowings (the second radishes and the first brassica baby salad mix (mustards) have emerged and are ready to thin to 1″. Sometimes we use thinned seedlings as a salad garnish, but it takes more time than simply pulling them out, and it takes attention to keep them clean. This summer we grew more cover crops rather than seed crops, which we have been growing in summer for several years, because we were short of workers. 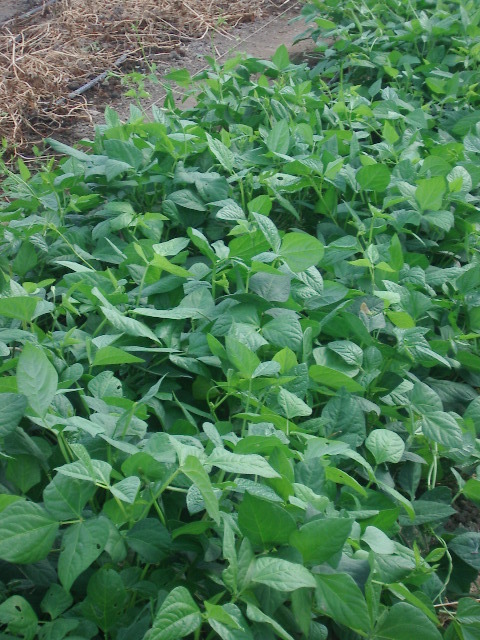 In the photo below you can see some healthy cowpeas I’m going to be pulling up later today, as well as some pulled up and dried buckwheat. We don’t dig our cover crops under, just let them die on the surface for as long as possible, shedding bits of dead leaf, then haul them to the compost pile. With the cowpeas, we hope to leave the nitrogen nodules from the roots, by ripping the plants up roughly! Iron and Clay cowpeas as cover crop in the hoophouse. These cowpeas have been cut back two or three times over the summer, to keep them manageable. At one point, they were black with sooty mold growing on aphid honeydew. We wondered if it was going to be a bigger problem, but after we cut the plants back, most of the aphids seem to have died. We also got a healthy population of ladybugs. December beds with row cover. I gather readers are planning for winter, as many folks have been visiting my Winter-Kill Temperatures List of hardy crops. I update this list every spring, with the info from the previous winter. It’s useful for planning harvests based on forecast temperatures, and it’s useful for planning which winter crops will grow in your location, either inside or out. On the same theme, I just discovered the WeatherSpark website which provides “The Typical Weather Anywhere on Earth”. Enter your nearest town or airport and you get clearly explained info with fascinating graphics of how the weather goes over the year in your locality. Note this is not a forecast site, it’s about average weather for each place. Useful to people who’ve recently moved and want to know what to expect this winter, or to new gardeners who haven’t paid so much attention previously. Or to those who want to check their assumptions (I really thought the wind was out of the west more of the time than records say). There are charts of high and low temperature, temperature by the hour each month, cloud cover, daily chance of precipitation (both rainfall and snowfall), hours of daylight, humidity, wind speed and direction and solar energy. A big help in making wise decisions. I know that climate change is going to cause havoc with averages, and we’ll need to learn to become better weather forecasters individually, and to use soil temperature and other metrics to decide when to plant. But this website explains things well. 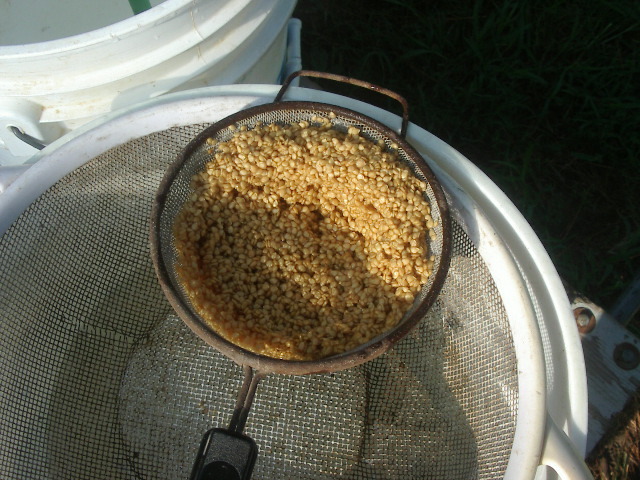 Tomato seed strained in a sieve. I wrote a more concise description of saving tomato seed for the Mother Earth News Organic Gardening blog. For the full length version, see my two posts here and here. The October Growing for Market is out. Flower farmer Erin Benzakein writes about getting to grips with the marketing side of running a farm. She encourages farmers to get good photos, step out from behind the camera, and dust off their website. I could use some of this advice! (I’ve been very busy writing a hoophouse book, and have necessarily paid less attention to giving presentations and to rejuvenating this website! 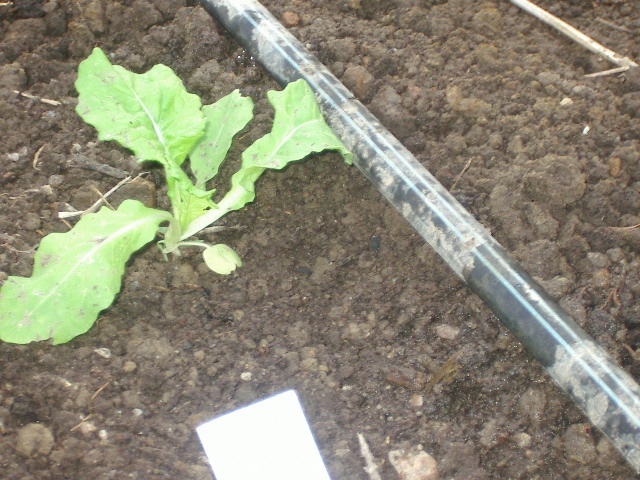 Kai Hoffman-Krull writes about on-farm trials of bio-char. I’m looking forward to reading that. 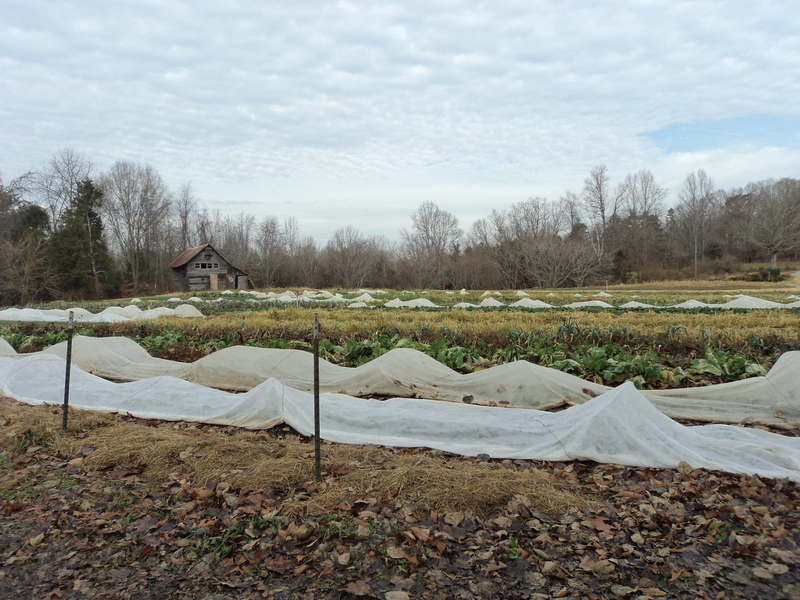 Jesse Frost writes about winter CSAs and profiles some he visited. Chris Bodnar covers Italy’s thriving agricultural co-ops and asks if this could be a model for the next phase of the locally-grown movement. Lastly Zach Loeks offers the first of a two-part series on Transitioning to a permaculture market garden. The September/October issue of Organic Broadcaster is also out. 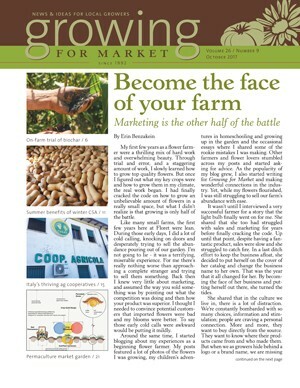 Articles include attending to soil health to improve production; the top reasons customers buy organic foods (accountability, environment, health); interseeding cover crops in cash crops; an interview with farmers in the MOSES Farmer-to-Farmer Mentoring Program; designing an efficient pack shed; and selecting the right meat processor. Lastly, the campaign www.keepthesoilinorganic.org has posted a letter a letter recently sent out by farming mentor Eliot Coleman about the travesty of allowing hydroponics to be certified as Organic. 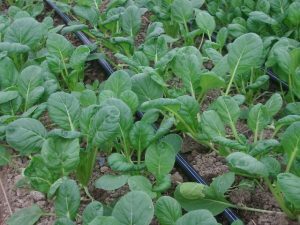 Hydroponics is a system of growing plants anchored in holes in plastic tubes, or in blocks of inert material, and feeding them with a liquid solution of things that work to produce mature plants. The arrogance of imagining we know everything a plant needs is astounding! The idea that all the many complex ingredients of soil can be replaced with a synthetic concoction is staggering! Organic farming is best defined by the benefits of growing crops on a biologically active fertile soil. The importance of fertile soil as the cornerstone of organic farming is under threat. The USDA is allowing soil-less hydroponic vegetables to be sold as certified organic without saying a word about it. The encouragement of “pseudo-organic” hydroponics is just the latest in a long line of USDA attempts to subvert the non-chemical promise that organic farming has always represented. Without soil, there is no organic farming. Eliot Coleman will be a speaker, along with Fred Kirschenmann, Enid Wonnacott, Jim Riddle, Will Allen, Jeff Moyer, Dave Chapman, Anaise Beddard, Lisa Stokke, Tom Beddard and Linley Dixon at the Jacksonville Rally of the Keep the Soil in Organic movement. Oct 31, 2017 at 12:45 pm – 2:00pm EDT. Omni Jacksonville Hotel, 245 Water St, Jacksonville, FL 32202, USAThis Rally will be a gathering of organic farmers and eaters from all over the world. The march will begin at the Omni Jacksonville during the lunch break from 12:45 to 2 PM on Tuesday, the first day of the NOSB meeting. There will be a 5 minute march to The Landing from the Omni. Lunch will be available at the Rally. For more information, call Dave Chapman at 802-299-7737.